This is my new dress from the ‘Holly Heatwave’ Collection at Kitten D’Amour. I was looking forward to the arrival of the collection given that it’s so excessively floral, fun and bright; I love the contrasting flower designs. Overall the collection runs large and this was the only dress which fitted me (luckily it was my preferred design anyway). I liked this dress because of the sleeveless design and the cross over straps. I adore dresses with interesting backs and there aren’t too many designs like this. 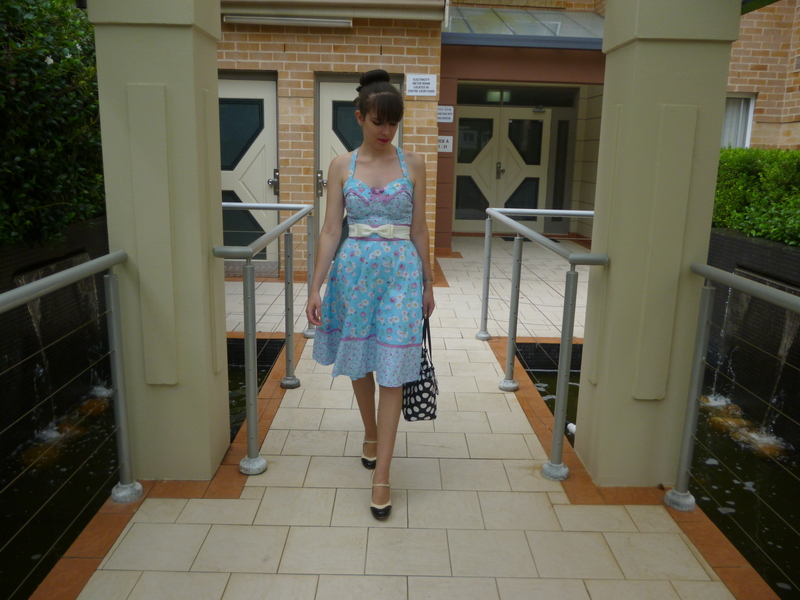 I had a dress a few years ago with similar cross over straps and my ‘Holly Heatwave’ dress reminds me of it. This dress is much longer than all of my others and I would like to take up the hem. I hope I will get around to it; I have been wearing it anyway because I love the dress and don’t want to wait. I really like the belt which is also from Kitten D’Amour. It makes me want to buy a couple of other similar belts from the store but in different colours, as they add so much to the look. I am way too obsessed with Kitten D’Amour right now. It’s becoming the only store I buy clothes from recently which isn’t great given that it is rather expensive. I am constantly checking out the website and awaiting the new stock. Next month I am going to stop spending; I can delay my spending ban which was supposed to start at the beginning of the year, by two months, right? I joined a few facebook groups recently for Kitten D’Amour fans and it’s really fun to chat with people and exchange thoughts on collections both past and present. Kitten D’Amour should seriously give me free clothes after all the publicity I provide for them. Oh, this dress is lovely and you look gorgeous, as usual! I also like dresses with interesting backs and this one is so sweet, the color, the print! I think yes, you should get a free dress after all the advertisement!!! I hope they send one to you! Such an adorable dress! You look so cute! I love the mix of prints in the dress. 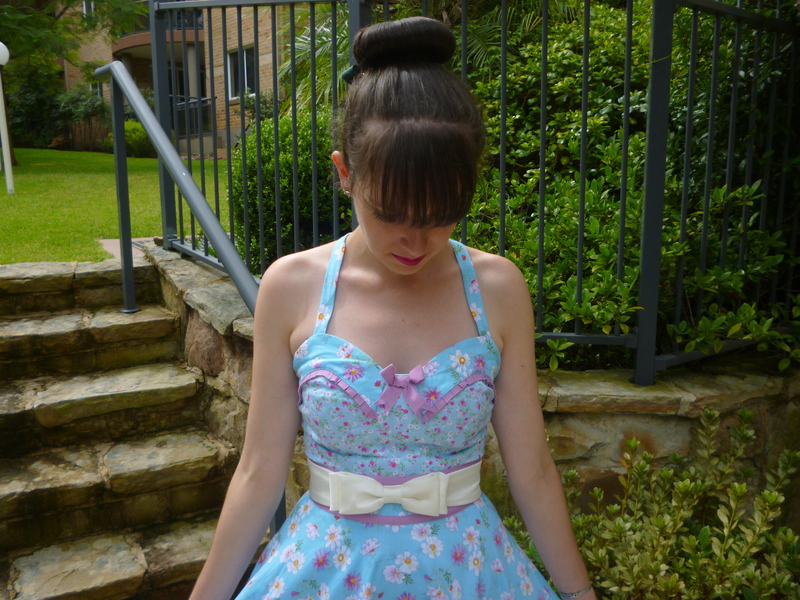 You look like a doll in this dress Imogen! Lovely! Love this dress! The whole looks is wonderful, and i adore the combo of dots, florals, and bows! Also this look very romantic ! This makes me miss wearing summer dresses!! Yours is so lovely. The color looks great on you! Such a lovely dress! Great purchase! I love how girlish you look with it and how it matches your blog theme! Cute as ever, love that fresh color. this dress was made for you!!! gorgeous style, color and print! That is a beautiful dress on you! 🙂 I really like the pastel colours, very sweet and cheerful. what an unique dress! 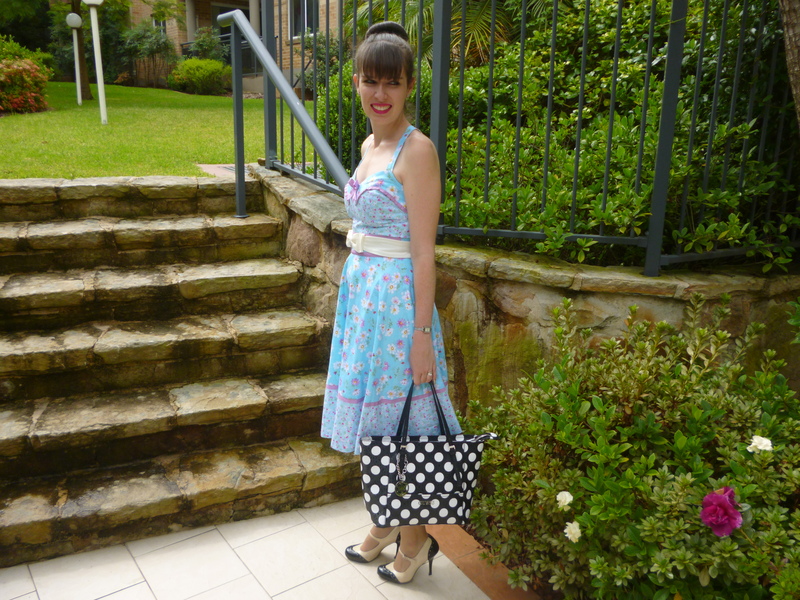 you look stunning wearing it…and I love your choice of shoes and bag with this dress! 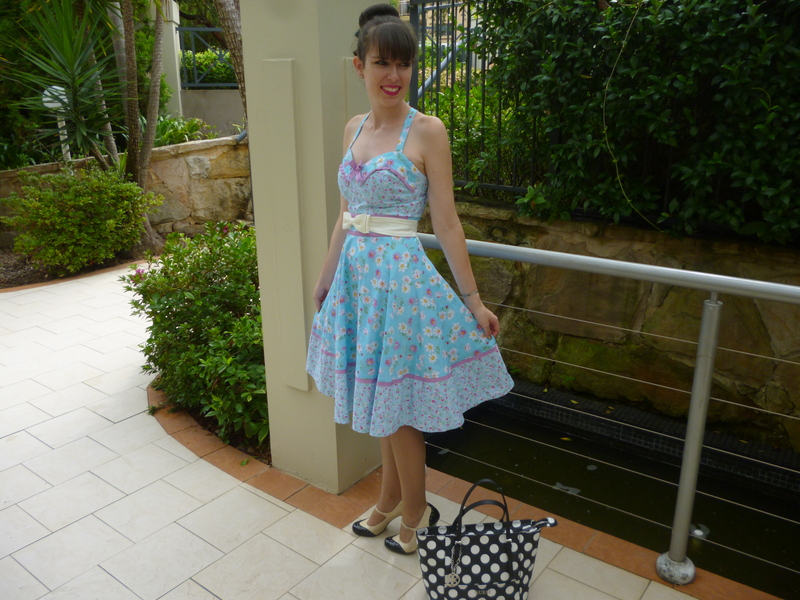 I LOVE This retro dress!! Ah this dress is wonderful! This slightly longer length looks great on you. I love the neckline and the pretty light blue color too. The bow belt is adorable with it. You look fantastic! You always have the cutest, most cheerful dresses Imogen, Love this one in beautiful blue. So girly and perfect for you! Enjoy the weekend! ❤ Ada. Love so much this dress, you look great! Marvelous outfit and your bag is very cute !